It’s common to see new and improved on products, but “Now! 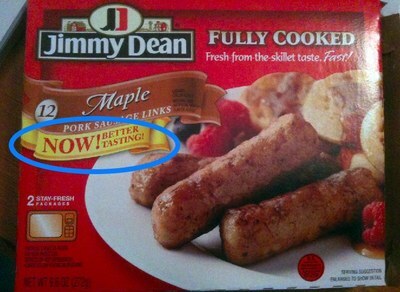 Better Tasting!” on Jimmy Dean sausages sounds like an admission that the product was previously not as tasty. What does a consumer think when they see “Now! Better Tasting!” on the box? If you’ve previously tried it before and thought it tasted bad, would you try it again because it’s now “Better Tasting!”? If you hadn’t tried it before, would you wonder how bad it must have been for them to now say it’s “Better Tasting” on the box? If you’re already eating this and liked it, will you wonder if you’ll still like it? Audible.com: Go the F**K to sleep Free!